Old homes are very prone to roof leaks and water damage. Since the roof is usually out of our sight as most people rarely set foot in the attic, they often go unnoticed. The first sign of a roof water damage is a discolored spot on the ceiling or a mold growth around the moist area. If you don’t address this issue in time, you could face serious issues. The worst of these can even be a complete roof collapse. 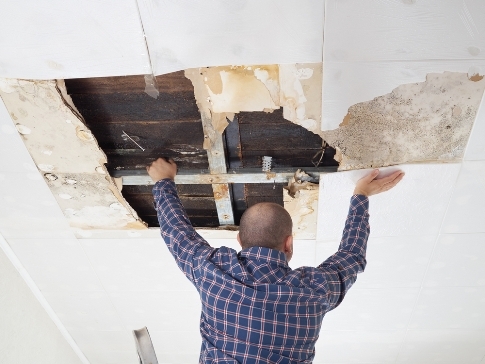 In this article, the experts at KIC Restoration share their experience with roof water damage, what causes it and most importantly, how to prevent it. The first thing you need to think about is your safety and the safety of your family. If the leak is a small one, simply put a bucket under the leak to collect the water. If there are no leaks, you can skip this. Next, try to determine if you’re dealing with a leak at all. If you can’t find the source of the leak, go to the attic and take a closer look. The issue may be from a burst pipe and not a leak. Finally, call a roof repair expert to assess the scope of the damage and offer their expert opinion. The goal here is to determine the origin of the leak. The issue with damaged shingles most commonly occurs immediately after installation or many years later. The problems after installation can be the cause of shingle defects or poor installation. The way to solve them is to hire an experienced roofer to correct the leaks. However, if the leak occurs years after installation, sometimes you’ll have to consider a full roof replacement. Make sure to hire an expert, as smaller leaks can be fixed without having to do a complete replacement. The valley is the angle where parts of the roof meet. This is a problematic area as rainwater usually gathers there. If the shingles are turned on the side instead of being placed straight, this could pose an issue later on. Roof features such as skylights, vents or chimneys can also be a cause of a leak. These areas are particularly vulnerable since they are a direct link between the roof and your home. Chimneys are a frequent cause of a leak, as well as skylights. The flashing is the thin layer of metal experts install at critical areas of the roof. The metal most commonly used is galvanized steel. However, as steel shrinks and expands depending on the temperature, the flashing deforms over time. If the deformation forms a gap for the water to collect in or pass through, the flashing should be replaced immediately. Having to deal with a roof water damage is not an experience homeowners remember fondly. However, making sure you prevent a roof leak is much less demanding. The best way to prevent roof leaks is to have your roof inspected regularly. This can help prevent roof water damage before it even occurs. Professionals can detect potential leaks and water damage by examining some signs that homeowners might miss during self-inspection.